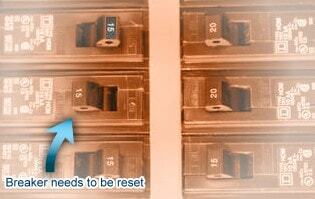 If the circuit breaker to your indoor or outdoor unit trips, you may reset it. Turn it to the "off" position if it isn't there already, then back to the "on" position. If the breaker trips a second time, then you should schedule a service call. The breaker is tripping for a reason. It is protecting the equipment, the wiring, and the house. Do not just keep resetting it and ignoring the situation. Yes, it is possible that maybe it is just a bad breaker or maybe it was just a thunderstorm. But you are dealing with high voltage and amperage, and possibly high temperatures, which could cause wires to melt, possibly starting a fire. One very common cause for breakers to trip is loose electrical connections. Larger aluminum wires especially, tend to expand and contract with the weather, causing the connections to loosen over time. It is just a matter of tightening the connections. * Use extreme caution, High Voltage! Another common cause is a direct electrical short in the wiring or equipment. This is identified by the breaker tripping instantly, once the unit attempts to start. In this situation, do not even try to reset the breaker again. Call for service immediately. Sometimes the breaker for the outdoor unit trips because the compressor is having trouble starting. The compressor could be old, weak or just tight and a "Hard Start Kit" (installed by a service technician) might do the job getting it going again. Or it may be as simple as replacing a bad capacitor which helps start the compressor. Important: A circuit breaker should never feel hot to the touch. You can test the breaker by touching it with the back of your fingers - not your fingertips. The breaker should feel room temperature or warm. If it is hot, this could indicate a problem. Do not ignore it!